SpotCam has a built-in "Sleep Mode" which is useful for those who don’t want camera to continuously stream and record video or those who has limited data plan. When SpotCam works in sleep mode, it won’t stream any video to cloud and won't record any video either unless a pre-defined condition has been triggered. User can decide what condition to trigger the camera awake and start streaming in sleep mode setting. For each trigger, camera will stream 3 seconds of pre-event video and 30 seconds post-event video to the cloud for recording. Since camera will only upload the video stream when there is an event triggered, this can largely reduce the total data size transmitted in the network, which is helpful for users whose data plan is limited. 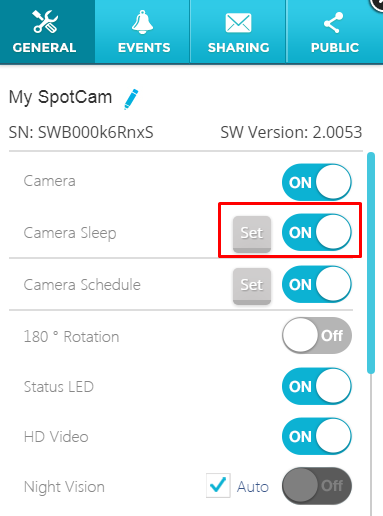 How to setup sleep mode for my SpotCam? Please enable Alert function before you enable the sleep mode for your SpotCam. 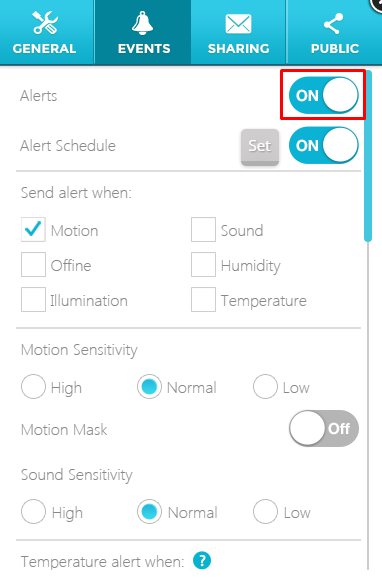 After enabled the alert function, you will be able to enable the sleep mode. Once sleep mode enabled, you will see a "Set" icon appears at the left side of the switch icon. 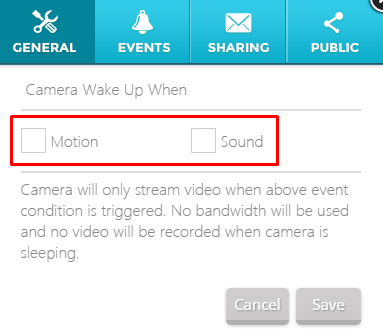 Please click on Set icon then choose the event type that you want camera to wake up. The camera will only upload the video stream to cloud server and record when selected event is triggered once setting complete. Note: If you didn’t select any event type in this page, the sleep mode function will automatically disable and camera will keep recording.